Hello Baltimore! Heading your way this week! Allison will be trekking to Baltimore on to represent strawberryluna in presenting a lecture to the Maryland Institute College of Art (MICA) Graphic Design & Printmaking Departments this Thursday November 15th as a guest of the Poster & Screen Printing Class taught by Kim Bentley of Baltimore Print Studios. Allison will be giving her lecture at Noon in the Brown 320 lecture hall on Thursday, November 15th and then showing work afterwards in the Screenprinting Studio, D202. Both events are open to anyone. Special thanks to the GD dept. for their help and support in bringing Allison to MICA! Afterwards, Kim, Kyle & Allison will be hanging out at Baltimore Print Studios on Thursday evening for some printy good fun times. Click here for more information about MICA. Click here for more information about the lecture. 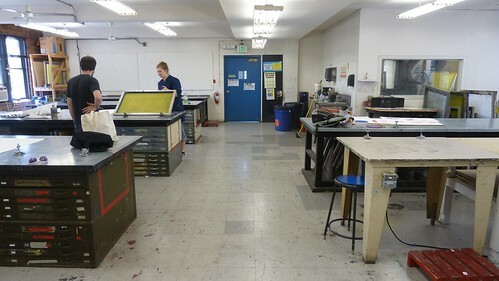 Click here for more information about Baltimore Print Studios. This entry was posted in Events, Lecures & Talks and tagged baltimore, Baltimore Print Studios, graphic design, Kim Bentley, Kyle Van Horn, lecture, Maryland Institute College Of Art, MICA, printmaking, strawberryluna by allison. Bookmark the permalink.